Oh My Cod! w/ Parmesan Polenta — Happy Food Co.
*If your olive oil has solidified in the fridge, place the sealed container in a cup of warm water. It will return to a liquid. PLACE the cod fillets on a plate and sprinkle both sides with lemon pepper. TRANSFER the cod to individual sheets of parchment. SLICE the lemon into rounds and squeeze over each cod fillet. 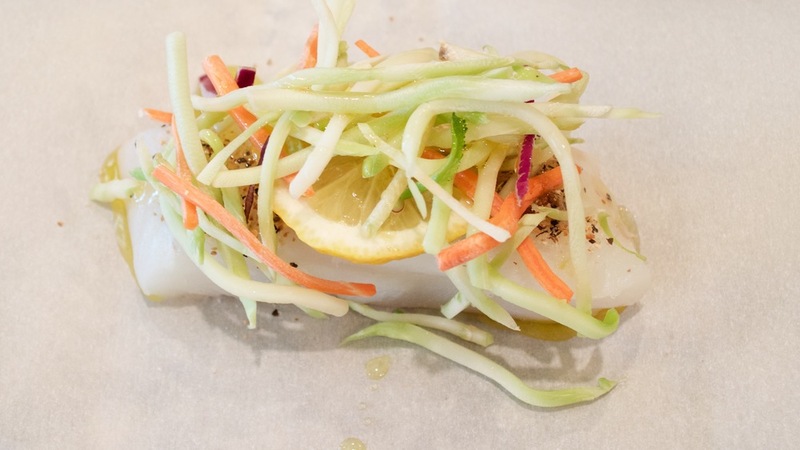 TOP each fillet with a lemon slice and equal portions of broccoli slaw. Then drizzle with lemon olive oil. WRAP the parchment paper around each fillet and secure it with kitchen string. COOK the corn in a medium skillet over medium-high heat until lightly browned, about 3–5 minutes. Set aside. BOIL 3 cups of vegetable broth in a medium saucepan over high heat. ARRANGE the cod packets on a baking sheet. BAKE for 10–15 minutes until the cod is cooked through and flakes easily with a fork. GRADUALLY WHISK the cornmeal into the broth. Reduce heat to low. STIR the corn, butter and parmesan cheese into the polenta. SERVE with the cod and enjoy.